Pour almonds with boiling wayer for 10 min, then drain it, rinse with cold water, drain it, peel nuts, dry with towel. Grind peeled and dried nuts in coffee grinder into flour, mix with sifted sugar powder, slightly mix whight with fork, adding white in almond flour stir well till mass becomes elastic and smooth. 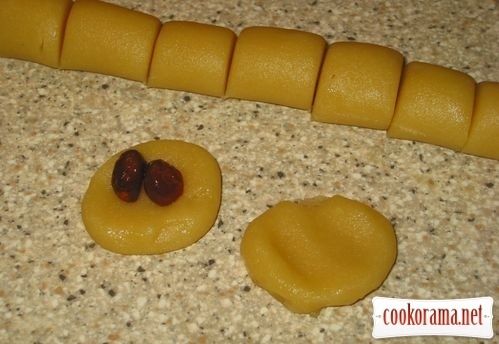 Form ready marzipan mass into ball, wrap in film and put in the fridge for night. Pour cherries with cognac and leave for night too. Remove cherries from cognac the next day, drain liquid, dry cherries on paper towel. Put near a bowl with some oil, cover tray with parchment, grease it with thin layer of oil. Oil hands and table a bit, divide almond mass in 2 parts, roll «sausage» from each, cut in pieces, press a bit, put nside 2-3 cherries, pinch the edges and roll a ball. Oil hands and table, when necessary. 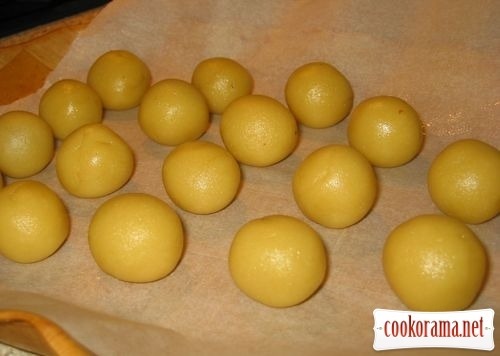 Spread balls on parchment, put in fridge. Melt chocolate in water bath. Strung on sweets on toothpick, dip in chocolate, stick in apple, put in fridge to cool the chocolate. Next carefully remove toothpicks, keep sweets in fridge. 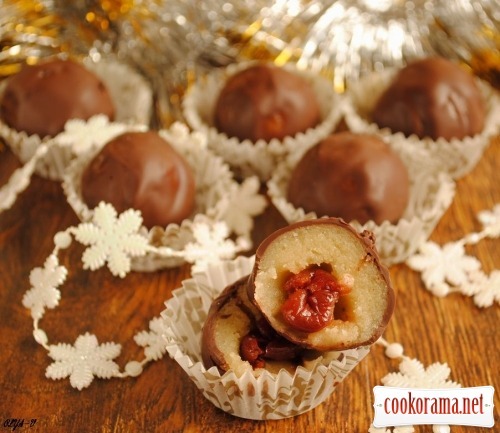 Top of recipe "Marzipan sweets"
Дуже гарно! Особливо на новорічний стіл. Спасибо за отзывы! Готовьте конфетки, они того стоят, очень вкусные получаются, ни в одном магазине таких не купишь.